Fine particles in the 416 Fire smoke can cause difficulty breathing and persistent coughing. Health officials advise residents stay inside when possible. 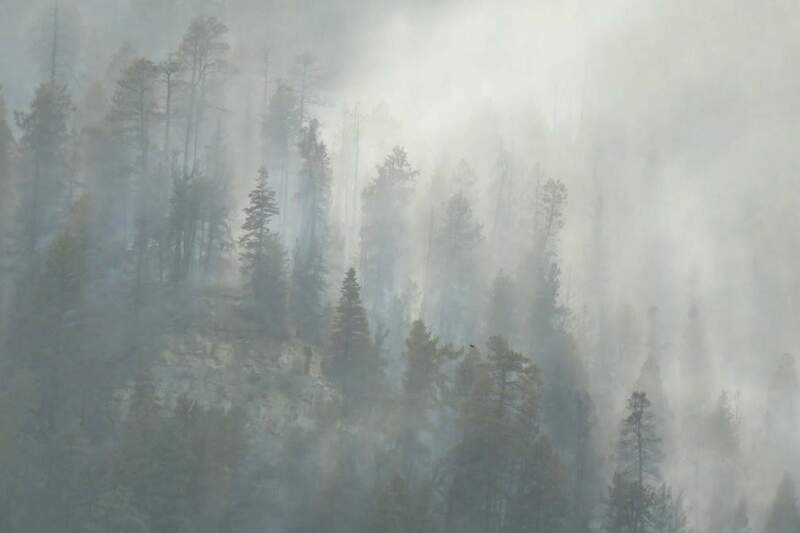 Heavy smoke is expected to blanket the region during the late evenings and early mornings for as long as the 416 Fire roars through the San Juan National Forest north of Durango. With it come fine particles that can cause persistent coughing and difficulty breathing. Data collected near Bondad has shown spikes in poor air quality during the early morning hours in recent days, a trend that is expected to continue through the weekend, said Scott Landes, meteorology and prescribed fire supervisor with the state’s Air Pollution Control Division. When moderate to heavy smoke is present, residents should consider limiting physical exertion and time outside, according to San Juan Basin Public Health advisories. If visibility is less than 5 miles, smoke has reached levels that are unhealthy. Air quality tends to improve in the afternoon, but if residents have been exposed to polluted air in the morning, they should still consider taking it slower later in the day, he said. “The health effects of fine particles linger,” he said. Those who commute by bicycle can continue to do so, but cyclists who are training outside should limit their activity, he said. It is unknown exactly how exposure to fine particles from fires can affect health in the long term, he said. In the short term, residents may experience difficulty breathing, wheezing, coughing and phlegm, according to the health department. Mercy Regional Medical Center staff have not seen any patients visit the emergency room because of the smoke, said spokesman David Bruzzese. However, those with allergies and asthma are likely to experience increased symptoms because smoke irritates the respiratory system, said Dr. Donald Cooke of Allergy Asthma Specialists. Dry eyes, increased sinus pressure, nasal drainage are all possible reactions to the smoke, he said. The particles from the smoke will make their way into the respiratory system where they can get stuck. Specialized cells can clear the particles away, but it takes time and sometimes it never happens, he said. “Some of it will get cleared out, but not all of it,” he said. Air-quality data collection in the area is limited to a monitor near Bondad, he said. However, the state sent San Juan Basin Public Health additional monitors that were expected to arrive Thursday. Additional data is expected to be publicly available at purpleair.com.